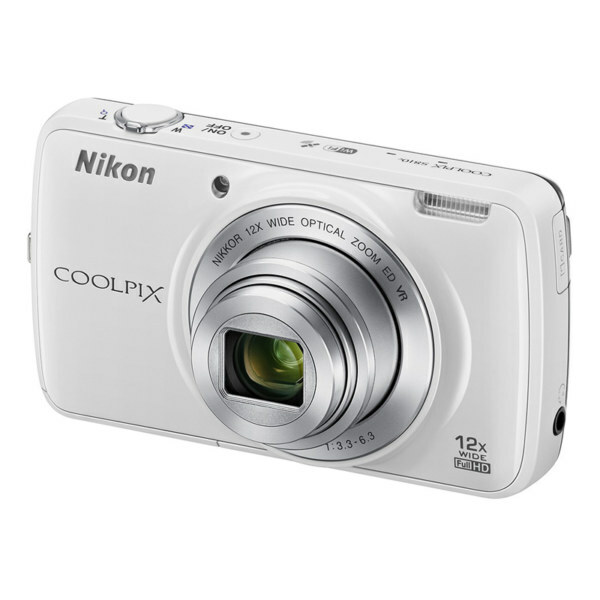 This Nikon Coolpix S810c digital camera features Android 4.2.2 Jelly Bean capabilities and built-in Wi-Fi, making it easy to share photos and video footage with loved ones. Built-in GPS lets you add location information to your shots. Captures high-resolution images up to 4608 x 3456 pixels. Plus 24x Dynamic Fine Zoom through a NIKKOR ED glass lens with 9 elements in 7 groups for precise zooming and accuracy. With antireflection coating and approximately 1,229,000 dots resolution makes navigating features and setting up shots simple. Allows you to record sharp MPEG-4 AVC/H.264 video footage with up to 1920 x 1080p, 30 fps resolution and linear PCM stereo sound. Helps limit the effects of camera shake and vibration to minimize blurring and ghosting. Include backlight, beach, black-and-white copy, close-up, dusk/dawn, easy panorama, fireworks show, food, landscape, night landscape, night portrait, party/indoor, portrait, show, sports and sunset for versatility. Lets you capture up to 3 shots at approximately 8 fps (frames per second), so you can shoot footage of fast-moving subjects. Include auto, cloudy, daylight, flash, fluorescent, incandescent and preset manual for clear image capture in various lighting conditions. With TTL (through-the-lens) auto flash control and monitor preflashes allows you to add light to scenes when necessary. Includes border, crop, D-lighting, filter effects, quick retouch, rotate image, skin softening and small picture features to enhance your creativity. With 9-area automatic selection and center, face priority, manual, subject tracking and target-finding AF options helps you bring subjects into clear view. Let you access Android apps via Google Play, check your e-mail, upload shots to social networking sites and more. Enables you to wirelessly transfer shots to a compatible cell phone or tablet, so you can easily share them with friends and relatives. The Nikon Image Space app (download required) offers Cloud-based image storage and sharing. Allows you to track the locations where shots were taken. Offers ample room for file storage. Supports microSD format (card not included) for easy expansion.